The camps involve 5 full days* of intermediate or advanced level coaching from Monday to Friday. Working in small groups of just 4 to 8 students per instructor, expert coaching at different levels allows participants to split up into different groups according to the type of skiing they’d like to do, with options such as off-piste, confidence building and technical training on the menu. Intermediate and advanced skiers will enjoy expert ski coaching from ZigZag’s top trainers over these dates. 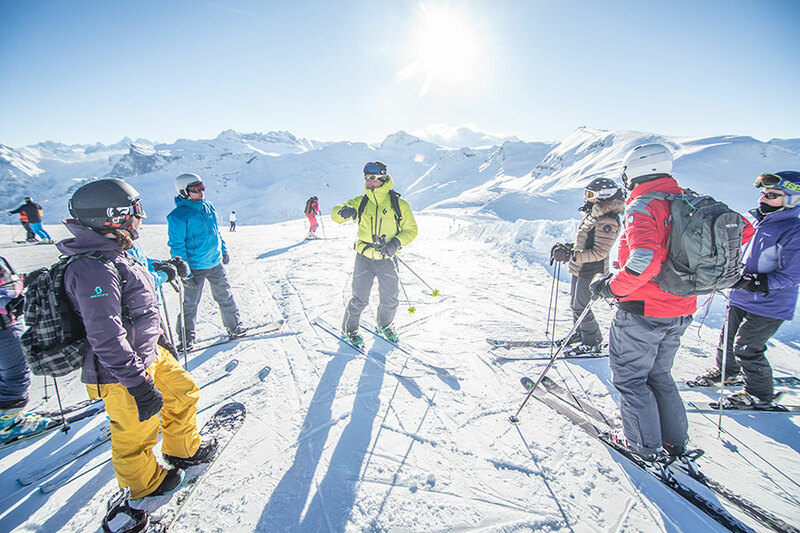 Ideal for couples who love to holiday together but enjoy different types of skiing, those in need of off-piste adrenaline can be left to explore with a guide, allowing their partners to develop their technical skills and confidence at a more moderate pace with an instructor. The training and guidance will be adapted to suit the levels of ability of those who sign up, with different groups for different levels of ability. All participants must be capable of skiing basic, easy off piste (if you’re not sure whether your level is sufficient, get in touch with us for a chat). 09h15 until 16h30 daily with a lunch stop at mountain restaurant each day. You’ll ski an average of approximately 6hrs per day. The training is designed to be intensive and some of our clients find they’re fatigued after day one or two, so don’t forget that you’re always welcome to finish your day early. Groups can meet up daily for lunch and après-ski drinks, making it a sociable experience for everyone involved. To encourage everyone to bring their other half along for a week of ski fun, we’re also offering a 5% couples discount! Meeting at Samoëns 1600m each morning at 09h15. Off piste skiing is entirely dependent on weather conditions, so the precise schedule for your week will be decided by your coach on a daily basis. Our coaches are great at finding the best conditions that are available, but please keep in mind that despite ongoing efforts, we’re not yet able to make it snow! We can’t promise fresh snow, but we will go to great lengths to find fresh tracks for you to ski. Communication is key and we encourage you to speak up in order that we know your expectations of the week. Each coach will decide with their group what they’ll focus on, so you make maximum progress in the areas you want to work on. Benefit from a 5% reduction if you book as a couple! We enroll 8pers per group, but group sizes may become smaller or larger as participants are shuffled between groups according to levels of ability. Decisions regarding the constitution of groups will be made by guides and instructors. Looking for accommodation? Contact our office for a range of accommodation suggestions to suit your needs and budget. Thank you for an absolutely brilliant week. I cannot begin to explain properly how much fun Nikki and I had but we still have smiles on our faces. Adrien, a very special thank you to you for looking after Nikki so well and increasing her confidence as without you I don’t think she would have had the courage to take on some of the challenges we all faced. Our guides Christophe and Phillippe were exceptional in their understanding of the snow conditions, the abilities of those in their care and above all the regard for the absolute safety of their groups. They never stopped giving us information about what dangers to look for, how to be safe and helpful tips about how to handle ourselves in some of that wonderfully deep untracked powder they found. You were all great company and we had a lot of laughs so please pass on our thanks to “Tof” and “Flac”. You have a superb business model with an outstanding team of people and I will recommend you to as many people as I can as your ski school is light years ahead of anything else we have experienced. Good luck for the rest of the season and we will definitely be coming with you again as soon as we have an opportunity. Reserve your place on one of our Off-Piste Ski Camp weeks now using the form below, or simply contact us directly via email or telephone.